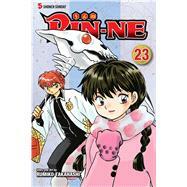 Manga legend Rumiko Takahashi’s lighthearted tale of a girl who can see ghosts and a boy from beyond. Ever since a strange encounter when she was a child, Sakura Mamiya has had the power to see ghosts. Now in high school, she just wishes the ghosts would leave her alone! When her mysterious classmate Rinne Rokudo shows up, Sakura finds herself following him into the amazing world between life and death! It’s almost the New Year, but Rinne doesn’t even have the cash for a decent meal. Is a haunted shopping mall his ticket to New Year’s treats? Later, Rinne finally catches a lucky break when he scores a weekend at a luxury hot springs inn. Unfortunately, his fellow guests are up to some serious monkey business! The spotlight on Rumiko Takahashi’s career began in 1978 when she won an honorable mention in Shogakukan’s annual New Comic Artist Contest for Those Selfish Aliens. Later that same year, her boy-meets-alien comedy series, Urusei Yatsura, was serialized in Weekly Shonen Sunday. This phenomenally successful manga series was adapted into anime format and spawned a TV series and half a dozen theatrical-release movies, all incredibly popular in their own right. Takahashi followed up the success of her debut series with one blockbuster hit after another—Maison Ikkoku ran from 1980 to 1987, Ranma ½ from 1987 to 1996, and Inuyasha from 1996 to 2008. Other notable works include Mermaid Saga, Rumic Theater, and One-Pound Gospel. Takahashi won the Shogakukan Manga Award twice in her career, once for Urusei Yatsura in 1981 and the second time for Inuyasha in 2002. A majority of the Takahashi canon has been adapted into other media such as anime, live-action TV series, and film. Takahashi’s manga, as well as the other formats her work has been adapted into, have continued to delight generations of fans around the world. Distinguished by her wonderfully endearing characters, Takahashi’s work adeptly incorporates a wide variety of elements such as comedy, romance, fantasy, and martial arts. While her series are difficult to pin down into one simple genre, the signature style she has created has come to be known as the “Rumic World.” Rumiko Takahashi is an artist who truly represents the very best from the world of manga.